"Sometimes The Smallest Things Take Up The Most Room In Your Heart!" A 12”x16” size tends to be more pleasing when framed and is the size I most frequently use. 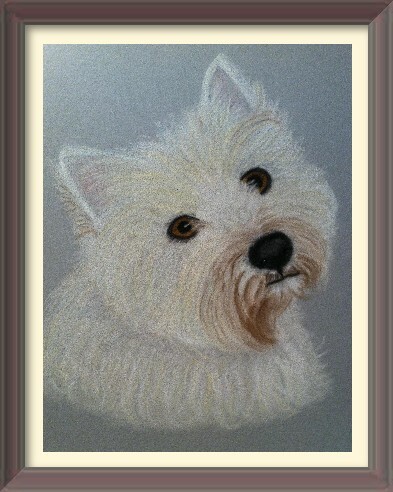 The 12”x16” is perfect for a head and shoulder study of any dog, or for a full length portrait of a cat etc. This size can also be used for up to 3 pets but better for 2 subjects (head and shoulders only otherwise they may look a little cramped). A 16”x20” size is suitable for full length portraits or portraits of multiple pets - Montage. Suitable for up to 4 subjects (head & shoulders) or a 3/4 and full body portrait of 1 or 2 subjects. The choice of size depends on the type of pet, its breed, the number of pets, where you plan to hang it and of course, your budget. If you are unsure as to what size would be best for your pet(s) then please contact me and I will give you an honest opinion as to what would be most suitable. I want your finished portrait to look great in your home. The price will depend on the size of the portrait, the number of pets in it, whether it is of the head and shoulders only or a full length study. The following table gives you an idea of what you can expect to pay. Prices are in GBP. Portraits are finished in quality bevel cut mounts to fit standard frames. Portraits are created on Velour Paper or Ingres paper but for pets my preference is velour adding a lovely soft furry texture. Please note that these prices are for ONE animal only and do not include postage/packing or framing. The prices quoted above are for SINGLE Subject Portraits only. I have recently been asked about creating smaller, framed portraits. So, here are three new "MINI" sizes that I have introduced. These make ideal bedside portraits or on a sideboard or shelf. they are only suitable for a SINGLE head portrait and they come complete with a white cardboard mount and black frame in the price. Postage/packing is NOT included in the price. All orders are packed carefully with instructions to avoid damage. Portraits are protected with acid free tissue paper and packed flat in a reinforced envelope or gently rolled into a mailing tube (for larger pieces). They are then sent by Royal Mail or Air Mail if outside UK. Payment can be made by Cheque (UK only) or PayPal. If you would like to pay by credit or debit card you can do so via PayPal and you don't even have to have a PayPal account to do so. The easiest and securest way to pay. I require a 25% non-refundable deposit before starting the portrait. This is because a great deal of time and effort goes into each portrait and also due to the expense of the quality materials used. Once the deposit is received, I can begin your portrait. When completed,the finished portrait is shown to you online. If you would like to make any changes to it then this would be the time to let me know. After you have approved it, you need to send me the balance of the price plus postage/packing. As soon as I have received your final payment, I will pack and send your portrait without delay. Please visit the online shop to pay for your deposit ( 25% of the pastel portrait price, excluding post/packing) using paypal. Alternatively if you do not use paypal I can also accept cheques or postal orders (UK only). Please contact me to discuss further if you are unsure about anything.